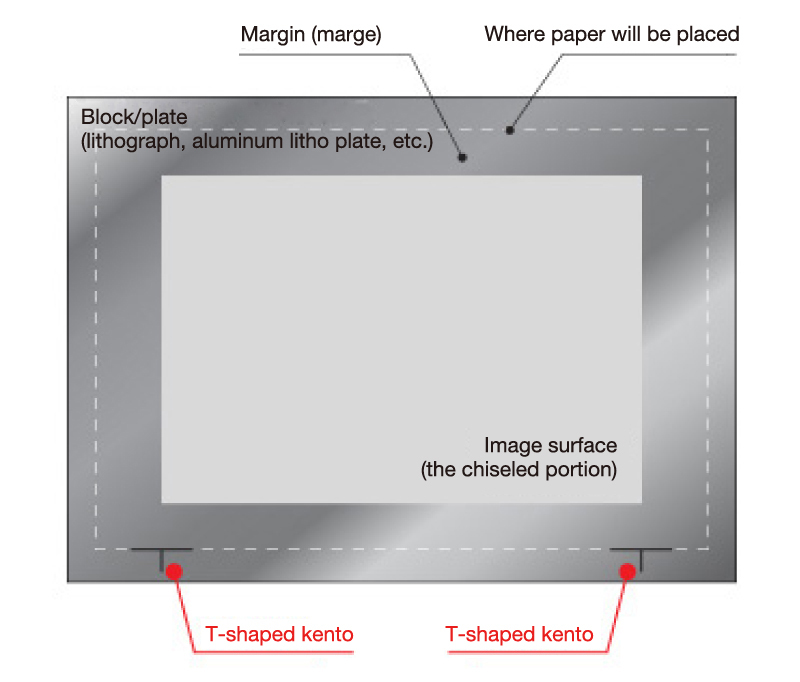 Registration marks (kento) are placed on the printing plates to position the paper correctly for printing. They are indispensable, particularly for works produced through multiple printing. The quality of the work will depend greatly on the accuracy of these marks. Registration marks have served a significant role in the Japanese printing culture. Initially, the mainstream ukiyo-e prints were sumizuri-e, single-colored works in black ink. In the 1700’s, however, multi-colored works produced using several printing blocks began appearing. Consequently, it became necessary to devise ways of avoiding color drift, and the technique of applying registration marks was perfected from mid to late 1700’s. This later led to the emergence of prints in a rich array of colors and to the popularity of ukiyo-e. 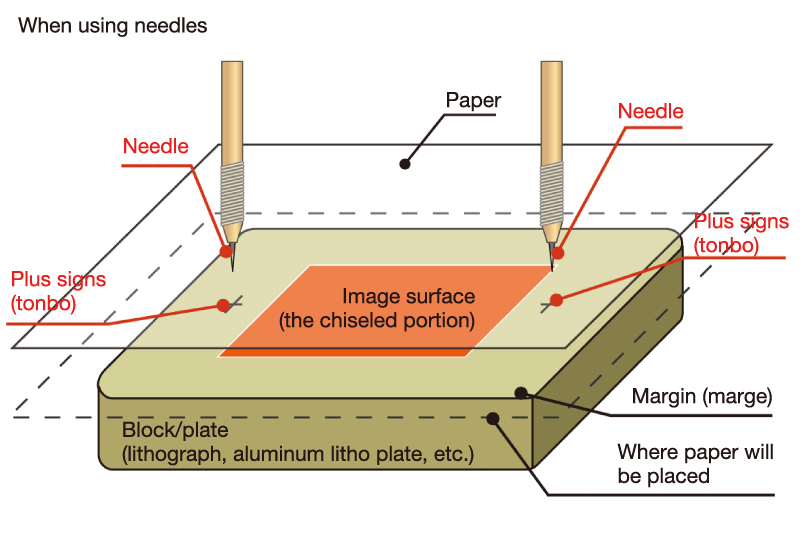 The methods for placing registration marks differ depending on the type of printing block. 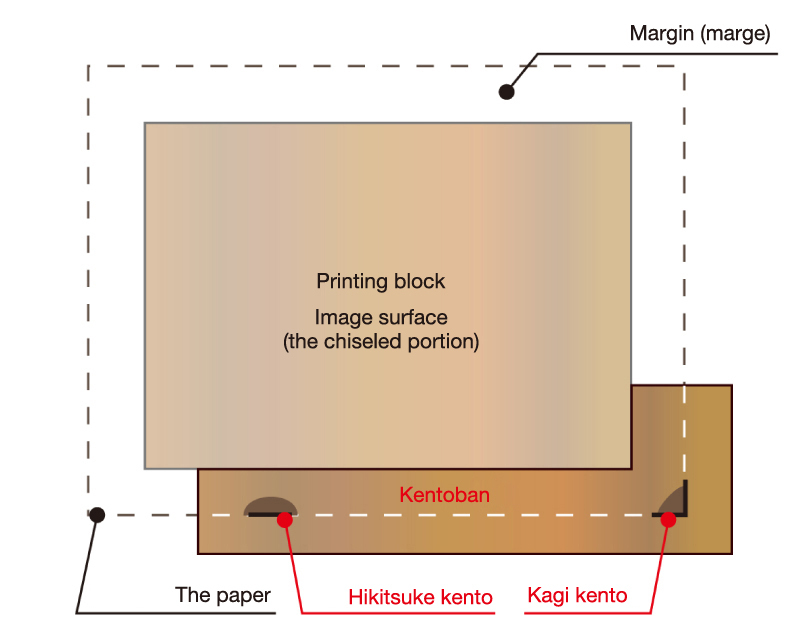 Woodblock printing uses registration marks called kagi kento, which is carved in the shape of the letter “L”, and hikitsuke kento, carved in a straight line. The paper is aligned in the appropriate position by resting it against these marks. The technique of carving these marks directly on the woodblock is referred to as “uchi kento” and using a separate wooden board carved with registration marks is called “soto kento”. In lithography, a T-shaped kento (T-mark) is engraved on the plate surface and, in general, the vertical line drawn on the right hand side of the back of the paper is aligned with this mark so that they form a plus sign. 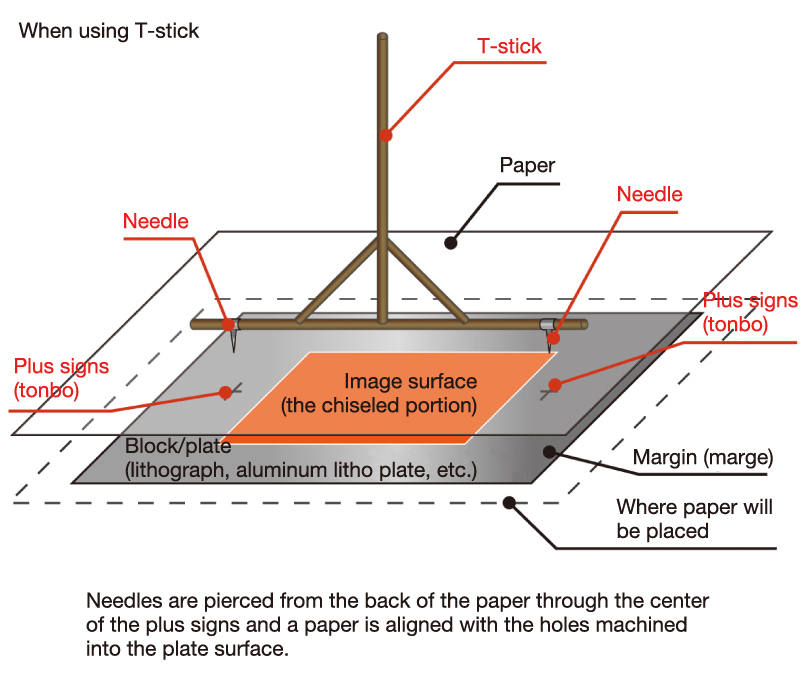 If the paper is larger than the plate, a plus sign (tonbo) is drawn in two locations on the plate surface and then needles are pierced from the back of the paper so that the tip of the needles meet the center of the plus signs. This is called “hari kento”. 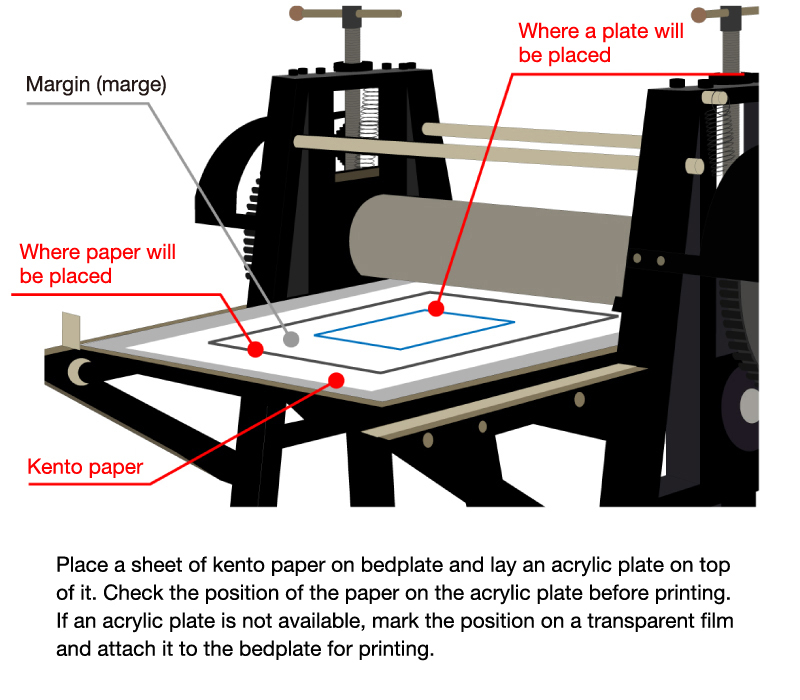 This hari kento method is sometimes used in copperplate printing too, but it is more common to set a transparent film inscribed with the positions of the plate and paper on the bedplate of the printing press. 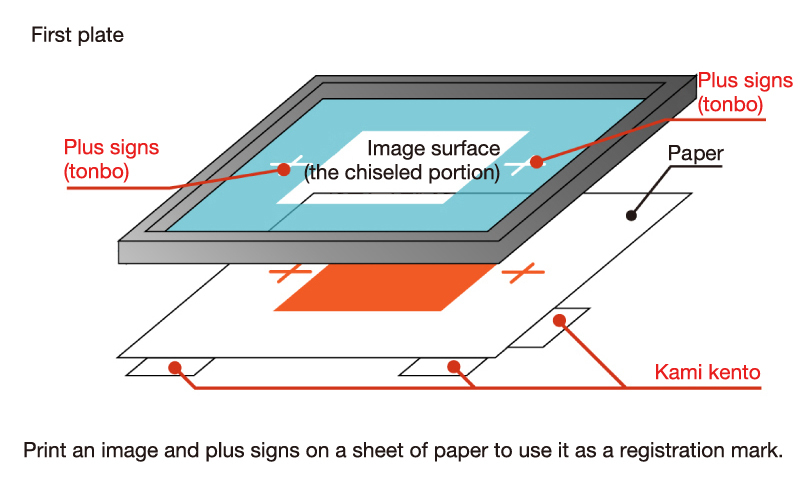 When doing multiplate screen printing, plus-sign registration marks must be burned onto the same position of each plate along with the print design when making the screens. When printing, first print one plate, with the registration marks included, on a sheet of paper and then cover the registration marks with masking tape for actual printing. 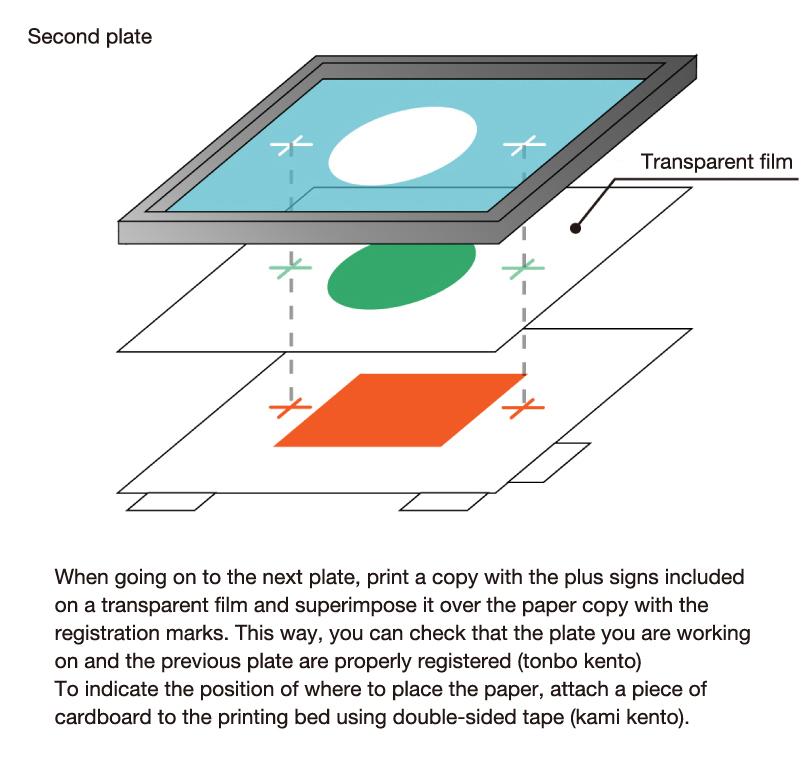 When going on to the next plate, print a copy with the registration marks included on a transparent film, superimpose this over the paper copy with the registration marks you prepared. This way, you can check that the plate you are working on and the previous plate are properly registered (tonbo kento). 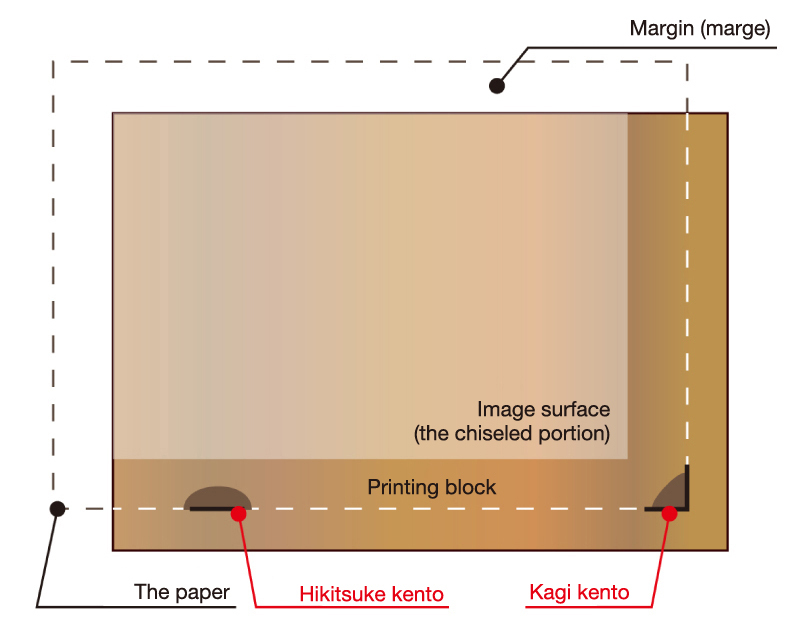 To indicate the position of where to place the paper, attach a piece of cardboard to the printing bed using double-sided tape (kami kento).